Product information "Twin Tuner TV Card DuoFlex C/C2/T/T2 (V3) & Octopus PCIe Bridge (V3) (SET)"
One PCIe x1 slot is only necessary for this Octopus card, expandable up to 8 tuners (4x DuoFlex). The world's first 8x tuner card, with the optional expansion modules DuoFlex. DVB-C2T2 high definition cable receiver for DVB-C / C2 / T / T2-modulated TV recording in H.264 / H.265 format. Master / slave connection, you only need one cable from your wall outlet to provide both tuners with a signal. 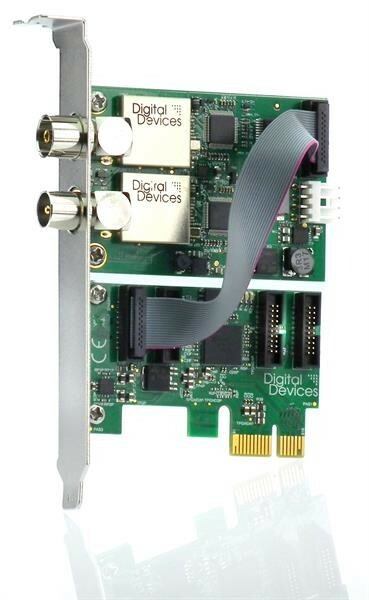 Related links to "Twin Tuner TV Card DuoFlex C/C2/T/T2 (V3) & Octopus PCIe Bridge (V3) (SET)"